The Assign River Reaches command enables the user to quickly assign a polyline as a river reach. From the Input ribbon menu, select the River Reaches menu item and then choose the Assign River Reaches command. The Assign River Reaches dialog box will be displayed. The following sections are used for defining data in assigning a river reach. 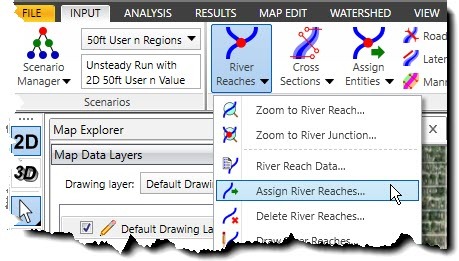 This section is used to interactively select a polyline from the Map View for assigning as a river reach. Click the [Pick] button and the dialog box will temporarily disappear. A prompt will be displayed on the status line, informing the user what to do next. Within the Map View, click on the downstream half of the polyline to assign as a river reach. 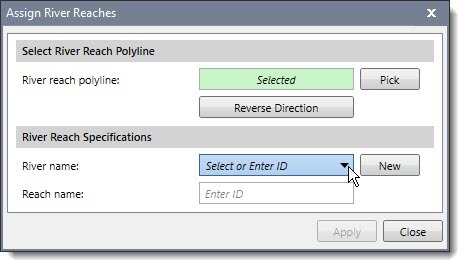 After selecting a polyline, the user will be returned to the dialog box showing that a polyline was selected. In addition, the software will display the assumed flow direction arrow on the polyline where the user clicked. If the river reach is assigned an incorrect flow direction, click the [Reverse Direction] button. This section is used to define the river name and reach name of the river reach polyline that was selected. Note that each river reach must have a unique ID, which is formed from the combination of the river name and reach name. This is how the HEC‑RAS software can correctly identify each river reach. The River name dropdown combo box can be used to select from an existing river name or to create a new river name. To create a new river name, either select Add New River from the River name dropdown combo box listing or click the [New] button. The software will then provide an empty field to define the new river name. Once the river reach has been defined, click the [Apply] button to assign the river reach data. The river reach ID will display on the Map View adjacent to the assigned river reach.